When you have one of the most important dignitaries in the world visiting your country, who also happens to be the beloved head of a church with more than a billion adherents worldwide, chances are that you’re going to want to step up his security as much as possible, just to make sure that nothing bad happens to him on your watch. During Pope Francis’ much-anticipated and highly-watched visit to the United States, the US government did just that by executing one of the largest domestic protective security operations in its history. Representing the Vatican (which is technically a state unto itself) and the Catholic Church, Pope Francis needed a different degree of protection than his predecessors who had visited the country, mostly because of his shunning of traditional defensive measures taken by the Swiss Guard (the Swiss military detachment sworn to guard the Pope) and other security services, in an effort to be more accessible to the people. Adding to the worries of the Swiss Guard are constant threats thrown at the Pope from ISIS and other radical Islamic terror groups in the Middle East, incensed by his vocal positions against their nefarious activities. So the US military, Federal Bureau of Investigation, the US Secret Service (traditionally charged with protecting US presidents and vice presidents), and local/state police departments, banded together to set up and launch a massive operation that would keep the Pope as safe as possible from a wide spectrum of attack possibilities. This large contingent apparently included the Air Force’s frontline stealth fighter- the Lockheed Martin F-22 Raptor. A pair of F-22 Raptors caught tanking up with a KC-10 Extender over New York last week by photographer Robert Dube, who was out planespotting near Queens, New York City. Dube, at first, thought that the lens of his camera was dirty, but upon further inspection of the image, noticed that he fortuitously caught the Raptors receiving gas from the KC-10. 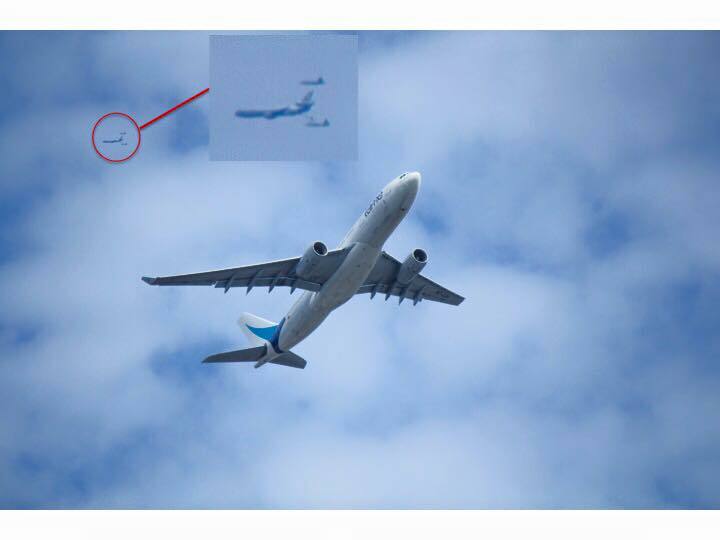 The picture above was captured by a planespotter, Robert Dube, near Bayswater, not too long after the Pope’s departure from New York City to Philadelphia aboard an American Airlines Boeing 777-300LR, call sign “Shepherd One”. Though at first appearing to be an anomaly on the image, possibly the result of grime or dirt on the sensor or lens of Dube’s camera setup, further inspection revealed that the small dark shapes above the Airbus in the image were a KC-10 Extender and two F-22 Raptors. Considering that there’s no real conceivable purpose for having top of the line combat aircraft tanking up in New York City airspace, and at the very same time such a dignitary was visiting the area at that, it could be assumed that the two Raptors were deployed as an on-call counter to a terrorist attack by way of air… Namely, the use of a hijacked airliner in a suicide run. While the airspace around Washington DC is indeed heavily protected and has been especially so since 9/11, the same can’t really be said for Philadelphia or New York City. Former New York Police Department Commissioner Ray Kelly once insinuated, in an interview with 60 Minutes, that the NYPD does possess the ability to take out a hijacked airliner as a last-ditch protective measure, but he was deliberately unclear (for good reason) on what exactly the NYPD would use to do so in the event of such an attack. 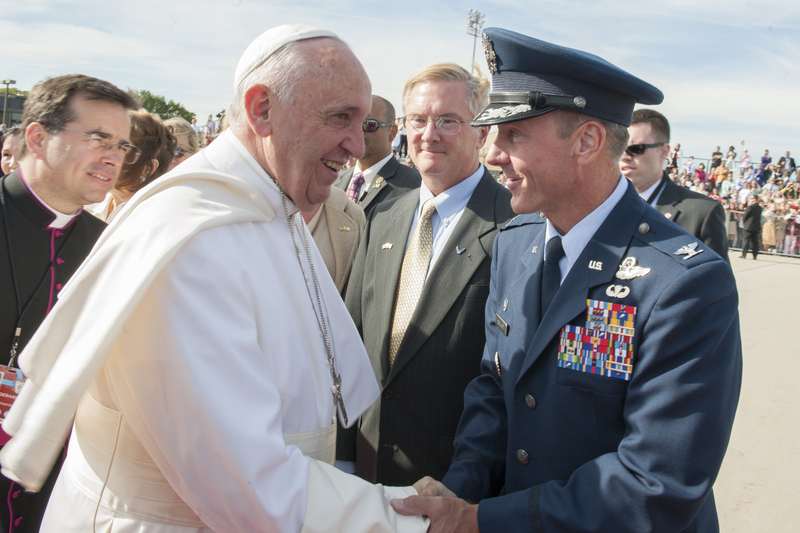 However, it’s unlikely that the Air Force would allow any aircraft to penetrate the “bubble” that’ll surround the Pope wherever he travels in the US. Back when Pope Benedict XVI visited the United States in 2008, the Federal Aviation Administration instituted a temporary ban on flight at 3000 feet and below; any aircraft violating the ban would be escorted out immediately, or shot down if uncooperative and deemed an imminent threat. The Air Force had apparently made available a handful of fighters for that visit as well. Pope Francis’ visit would have probably included another bubble of the sort as part of the security measures taken to safeguard him, enforced by the fighters loitering around. This isn’t the first time that F-22s have flown missions of the sort. For example, in the past, when NASA still utilized the Space Shuttle orbiters, Raptors from Tyndall AFB were used to clear the airspace around Cape Canaveral. Though this isn’t what the sleek and powerful fighter was originally built for, the Swiss Guard and all those who were tasked with keeping the Pope safe on his trip to the land of freedom and French fries could feel just a little bit more at ease, knowing that the most advanced air superiority fighter ever built was watching out for them from above. The plane on the picture is not the Pope Francis’s Boeing 777. It is an TAME AIRLINES from Ecuador. Be serious about writing information to the reader. It’s very clear you neither read the article nor even looked at the headline. The plane was an American Airlines Boeing 777. Apparently, “Shepherd One” was already out there circling the skies. Why does people find it hard to read articles nowadays and just judge them already on the pictures?